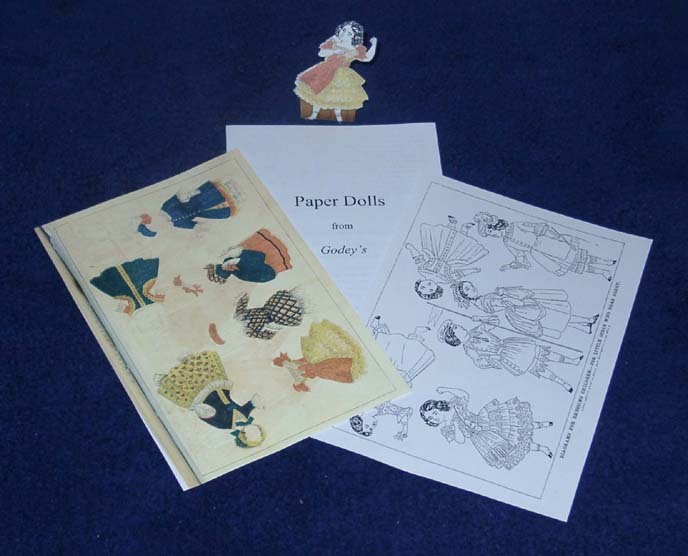 Paper dolls were a form of doll that allowed very expensive clothing for the dolls but at an almost negligible price. After all, it was almost as easy to print images of expensive clothing as it was to print common clothes. Paper Dolls were first imported from Europe but were later printed in the United States. Jenny Lind, a Swedish singer, was very popular during the 1850's and, not surprisingly, there were Jenny Lind paper dolls published for sale. These paper dolls were the first to appear in a magazine. Happily for us today, they were never used for their original purpose by the children of the magazine's original owner so we had an uncut copy to reproduce. You might note that the cut-out garments do not have paper tabs to wrap around the background figures. Such tabs are a 20th century device. To get the clothing to stay on the figures, the children would use a few small bits of beeswax (I use two, one on each shoulder, each about the size of two pinheads) pressed firmly between the figure and the garment. The beeswax acted almost like a contact adhesive but, because beeswax is not greasy, did not leave a grease spot. The picture shows the base page and the clothing page as well as one of the figures cut out and wearing the garment for that figure. This item is also available wholesale for dealers.